We’ve all been there. At a conference – you’re there to learn and meet people. People all around you seem to be talking, connecting, engaging – and you’re not. This awesome recent Forbes article by Darrah Brustein shares 15 Ways To Start A Conversation At A Conference (Without Feeling Weird). To your left, there’s a group of people talking in a tightly closed circle. Directly ahead of you, you see a smattering of people glued to their phones. To your right, there’s a line waiting to talk to the previous speaker. And there’s you: standing alone at a conference, feeling anxious because this event has an expiration date, knowing you “need to network”, but understandably feeling uncomfortable. We’ve all been there. In a room full of people, but feeling really alone. It’s as if everyone else has no qualms talking to new people, but that’s rarely the case. While for some this might be their natural habitat, for most it’s not. They’ve simply learned strategies to overcome this challenge. And now, so can you. Easier said than done, right? It can really be that straightforward. Before you walk into the event, take a deep breath. Remind yourself that everyone is there to connect with new people, and that you’re doing them a favor by initiating a conversation. If it takes your saying something positive to yourself to pump yourself up, do it. 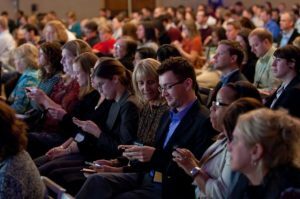 Fight the urge to get on your mobile device when you arrive at a session and take a seat. Instead, sit next to or near enough to someone who is alone and turn to talk to them. Ask them topical questions like, “Are you familiar with this speaker?”, or “I’m looking forward to _____ about this upcoming session. What compelled you to choose it?” Or, when the speaker has wrapped, say something like, “I really enjoyed that! What did you take away?”. Always keep it positive. When it comes time to eat, do the same and broaden your questions to ask something like, “What’s been one of your favorite talks of the event so far?”. It will allow for your conversation partner to share, and give you a window into what matters to them, and from there, go deeper into the conversation. Flip the script and know that if you ask a thoughtful question during a Q&A, others will likely resonate with and/or appreciate it. One or two may approach you throughout the conference and connect because of it. Making yourself more visible within a large crowd can be a useful strategy. It’s understandable that when we’re uncomfortable, we tend to close off a bit, and our body language shows it. We cross our arms, fold into ourselves, and look away from people’ gazes. Be careful to showcase body language that is inviting rather than off-putting. Most people will take a moment to grab a refreshment. And often, you can say hello and connect with them when they’re grabbing a fruit plate or a drink. I’ve heard compelling stories from friends who have made some of their best new contacts simply by starting a light conversation while washing their hands or in line for the bathroom. Take advantage of these moments, too. If you have a conference badge or name tag on, hang out in the lobby of the hotel or convention center if you’re not interested in going to another session. Many folks will go there to work, take a call, or a breather. Finding a lower-key environment can allow for a less distracted conversation. It can be creepy to be the person who doesn’t make eye contact, but instead, scans everyone badges looking for your target. If you want to do your research, look for a listing of attendees and do so before the event. If you happen upon said person, you can demonstrate that you know a bit about them and/or their company so long as you can play it cool and they feel comfortable, not targeted. If there’s someone specific whom you’d like to meet, and for whatever reason, you feel uncomfortable approaching him or her, find a wingperson. Ideally, this is someone who knows that person, or has interacted with him or her. This person is in a position to be able to say, “Have you met my friend?” and create an opening for you. In the case of some conferences, you’ll get a list of attendees beforehand, or access to an app to which attendees subscribe. If there are people with whom you’d like to connect to collaborate (never to sell them something), reach out beforehand and ask if they’d like to connect one-on-one. Most conferences will organize happy hours or other designated time for ‘networking’. Everyone will be there to mix and mingle, so take advantage. This one may be vulnerable, but I suggest finding a place where you can stand, perhaps with a coffee at a highboy table, and just be there (with no one else and nothing distracting you). When someone comes within eyesight, nod, smile, and make eye contact. Or better yet, say hello. Put yourself in a physical position to wrangle in new conversations. Be friendly and open to everyone you encounter, whether it’s the person manning the bar, moving the chairs, or otherwise. Not only is it good practice, but you never know who might see you, what you might glean from that interaction, to whom they’re connected, or simply how much that might make their day. There’s no way I can encourage you to start conversations with strangers without reminding you of the importance of being yourself. It may be tempting to try to be who you think someone else is looking to meet, but that won’t last. Even if it means you don’t truly connect with everyone, that’s okay. Ask questions and respond in ways that are authentic to who you are. Follow up and stay in touch with those with whom you connected, as yourself. The whole point of these initial conversations in a manufactured conference environment is to grow them after the event ends. Doing that inauthentically from the start will do you, and them, no favors. Please click HERE to see the article in its original form.